BPR is transformational. BPR disrupts existing business processes – workflows, roles, business policies, procedures, supporting technology and underlying business rules. BPR requires new ways of thinking – doing new things in new ways. BPR results in fundamental changes in end-to-end business processes. BPR is strategic vs. incremental. Most organizations engage, formally or informally, in some level of ongoing incremental business process improvement. To be clear, ongoing incremental improvement is important in improving operational efficiency over time, but it does not result in fundamental shifts in business processes to support new and changing strategic objectives. BPR is essential to organizations that need to align the organization to support new and changing strategic objectives resulting from major shifts or changes in the organization’s business environment – such as competition, regulation, economic conditions, etc. that require an organization to rapidly adapt – or risk going into decline. Inteq’s transformational BPR approach results in highly effective, efficient, agile, saleable business processes, aligned to business strategy, that drive enterprise value creation, competiveness and innovation. Inteq’s approach to BPR provides the blueprint for business transformation – engaging people, processes and technology across the enterprise. Customer and business value is created by an organization’s business platform. An organization’s business platform is the integration of people, processes and supporting technologies across the tactical, operational and strategic layers of the organization. Effective in producing customer value and efficient in the utilization of resources to create customer value. Enables revenue to grow exponentially while staffing and operational expense grow linearly / incrementally. Enables new business functionality (activities, procedures, technology, mechanisms, roles, etc.) to be added quickly and seamlessly to the platform. Enables proactive early identification and rapid effective response to the shifts and changes in the business environment. Stability of the platform at the tactical, operational and strategic layers to enable an organization to leverage its strengths, exploit opportunities, and mitigate threats from changes to the business. Map the current state of work activities, workflows, roles and reporting relationships, supporting technology and supporting business rules. Identify gaps, root causes, and strategic disconnects in improving organizational effectiveness, operational efficiency, and in achieving organizational strategic objectives. Identify opportunities to address the gaps and root causes identified during analysis. Look for forward-facing opportunities – strategic, transformational opportunities that are not tethered to current state process. Select the opportunities that have the most impact on organizational effectiveness, operational efficiency, and support organizational strategic objectives, create a future-state map that comprehends the selected opportunities. Operationalize the opportunities. Design and communicate the new workflows and procedures, develop and test new/enhanced functionality, etc. Implement opportunities based on dependencies among changes/opportunities, change management considerations, project management practices, and performance monitoring techniques. Transformational BPR is essential to organizations that encounter a major shift or change in an organization’s business environment – such as competition, regulatory change or economic conditions that requires an organization to rapidly adapt – or risk going into decline. The shift or change in the business environment is sometimes referred to as a strategic inflection point – a term coined by Andy Grove, former CEO of Intel.Based on experience across the spectrum of industries across the world, there are 10 types of recurring shifts or changes in the business environment that require transformational BPR. Organizations experiencing or positioning for rapid growth require scalable business processes. To successfully support a 2x-3x increase in sales revenue or sales volume over a short interval of time, an organization cannot just add additional staff at a proportional rate. An organization needs to transform to a high-performing, highly-scalable process platform that enables the organization to accommodate rapid growth with an incremental rather than proportional increase in staff. Does information technology drive business transformation or does transformation require information technology? The answer is yes. Significant improvement in business processes can result from low-tech / no-tech changes in business policies, procedures and organization of workflow. However, transformation typically requires smart and aggressive application of information technology. When an organization implements or upgrades enterprise class application software, BPR is integral to a successful outcome of implementation – otherwise legacy and dated business policies, procedures and workflow rules will embed and future institutionalize into the operating fabric of the organization. Many industries and vertical segments are experiencing substantial increases in regulation from multiple regulatory bodies – national, state, local as well as industry self-regulation. Increased regulation requires agile and transparent processes. New regulations often require compliance within a short time frame. The regulations and “compliance” is often subject to interpretation – which continually evolves. Effective and efficient compliance requires frequent and often significant changes to business processes, increasingly higher levels of transparency, and increasingly granular reporting capability to internally monitor and ensure compliance and to provide regulators with objective support of compliance. Outsourcing and shared services are increasingly complex. The traditional notion of external outsourcing and internal shared services of business functions, such as call centers and customer support, are evolving into highly interrelated process flows between an organization and its business units, and with multiple outsource providers and/or shared services centers of excellence across multiple segments of business processes among multiple layers of an organization. These complex and highly interrelated process flows require fundamental transformation of the traditional notion of a business process and requires significant transparency across the process. Core to the success of outsourcing and shared services is balancing cross enterprise global best practices with the objective need for local variation at the business unit level. The term leaning / flatting the organization hierarchy refers to reducing levels of middle management. The assumption is that the tactical hands-on layer of the organization is already lean and high-performing – but the middle management layer is to too wide and deep. This is a valid assumption in a wide range of organizations. However, the problem is in execution. Although traditional tactics such as reduction in force, lay-offs and voluntary separation result in the reduction of middle management, these tactics often hollow-out the organization’s base of deep business knowledge maintained tribally by the former middle managers. Traditional tactics often result in expensive and time consuming rebuilding of this knowledge base. An alternative approach is to proactively glean and distill this deep tribal knowledge proactively. And, concurrently, to build the mechanical / rules-based procedural knowledge into the tactical layer of the organization and judgment based knowledge into the operational layer of the organization. This approach results in a naturally lean (and inherently stable) middle management layer that is self-sustaining over time. To fully realize the value from an acquisition or merger requires integration of the constituent organizations at multiple layers – tactical, operational and strategic as well as the enabling components of each layer – people / roles, processes and technology – into a cohesive, robust (stable) high performing platform. Organizations that are active in acquisitions require business processes that are agile and highly extensible to enable the organization to rapidly integrate and leverage new product and services lines. The concept of enterprise best practices balanced with local variation (See #4 above -Outsourcing and Shared Services) also applies to Mergers & Acquisitions. The converse of mergers and acquisitions is divestitures and going private. A business unit of a public company that is privatized or becomes an autonomous public company requires an equally fundamental transformation to enable the organization to fully realize the benefits and mitigate the risks of privatization or autonomy. The new organization is no longer subject to the operating polices of “corporate” and in the case of privatization, no longer subject to the scrutiny of a public company, including the quarterly reporting cycle of wall street analysts and many regulatory requirements associated with public organizations. Divested and privatized organizations must rapidly transform to shed the operating constraints of the past and embrace and exploit the freedom to innovate. The transformation from entrepreneurial culture to an operating culture is difficult. This applies to organizations in the pre-IPO stage, rapid growth organizations (see #1 above) and to organizations that are more mature but have not yet made the transition from an entrepreneurial culture to a process based operating culture. It’s very difficult to scale an organization that has not made the shift to a process based operating culture. And there is inherent risk associated with losing a hero with deep tribal knowledge. To achieve sustainable growth, an entrepreneurial organization culture must transform to a process based operating culture. Many organizations have a significant portion of their workforce approaching retirement. And, similar to the hero based entrepreneurial culture (see #8 above) as well as wide and deep levels of middle management, have relied on the accumulated tribal knowledge and judgment of this portion of the workforce to carry the business. However, unlike the entrepreneurial culture, this accumulated base of tribal knowledge is rapidly exiting – and it’s becoming increasing difficult to backfill because of increased demand and competition for business talent. It’s crucial for these organizations to capture and transform this knowledge into a process based operating culture while this knowledge is available – and develop highly effective and efficient business talent acquisition and retention processes to sustain the backfill and continually glean and integrate business knowledge. Renaissance is the transformation of an organization that has (or had) significant market share and is (or was) highly successful in a particular industry segment for many years – but all of a sudden competitors begin to make significant headway in the space – placing significant pressure on the organization’s leadership position. The leadership position and level of success over the years masks growing issues in connection with organizational effectiveness and operating efficiency. Organizations in need of renaissance do not recognize and/or do not embrace a strategic inflection point and are caught flat-footed as their business environment changes. A BPR initiative typically results in more opportunities to transform the organization than an organization has the time, budget and resources to accomplish. Without a strong link to strategic objectives, the opportunities are untethered and often result in selecting and moving forward with opportunities that do not advance strategic objectives. The most important objective of an organization is to provide products and services that meet and exceed (and better yet – anticipate) the customer needs and requirements. An organization does not operate in a vacuum. There are numerous internal and external drivers of change – changing customer requirements, competition, regulation/legislation, product innovation, business strategy, economic conditions, changes in technology, etc. Effectiveness, efficiency and agility at the tactical layer is essential. However, fully engaging and analyzing the operational layers of the organization is equally important and essential to achieving sustainable results. Many BPR initiatives are based on high-level superficial analysis, which does not go deep enough to identify the underlying patterns and root causes of pain points in a process. 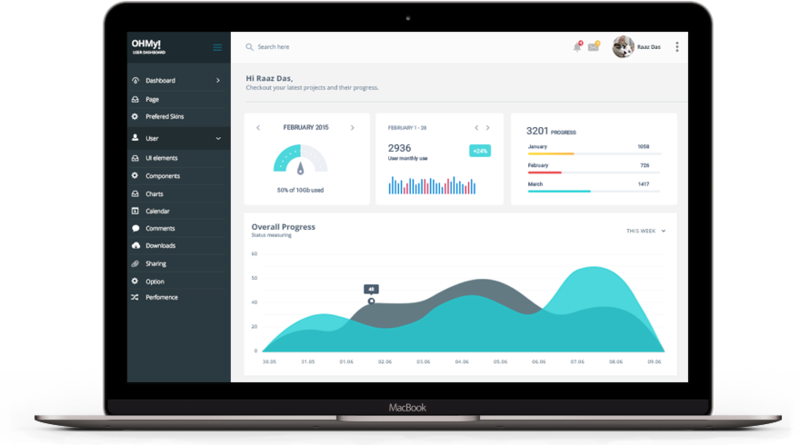 Conduct deep analysis: perform detailed current state analysis, broaden the scope of the analysis across functional silos and business units, and engage internal and external customers and stakeholder in analysis. Tactical issues in business processes are relatively obvious. Strategic issues are far more abstract and complex. The underlying patterns that need to be disrupted and reengineered cross many layers and dimensions of an organization. The opportunities to improve and transform an organization must be proactively developed, operationalized and implemented. It’s not going to happen on its own. Regardless of the dysfunctionality of a process, people are typically resistant to changing anything – roles, level of authority, reporting relationships, methods, etc. Try to deeply engage staff in all aspects of the initiative. Reach out and glean their input in current state analysis, opportunities for improvement, operationalizing and implementing improvements. Many BPR initiatives lack clear, ongoing communications. Staff at all levels need to know the impact of the initiative on their role, what is expected of them, the timeline, etc. 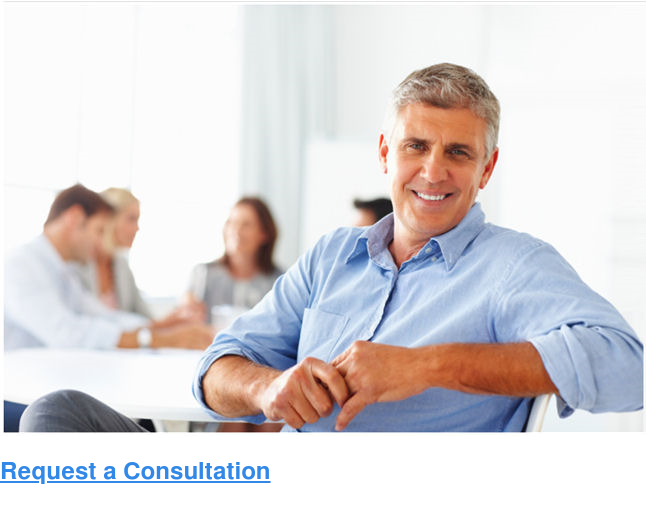 Develop a multi-channel communication plan during the planning stages of the BPR initiative. Transformational BPR solutions and opportunities require increasingly sophisticated information systems. Engage IT in the planning stages of a BPR initiative, and ensure that your organization’s IT platform is sophisticated and agile enough to support transformative BPR. 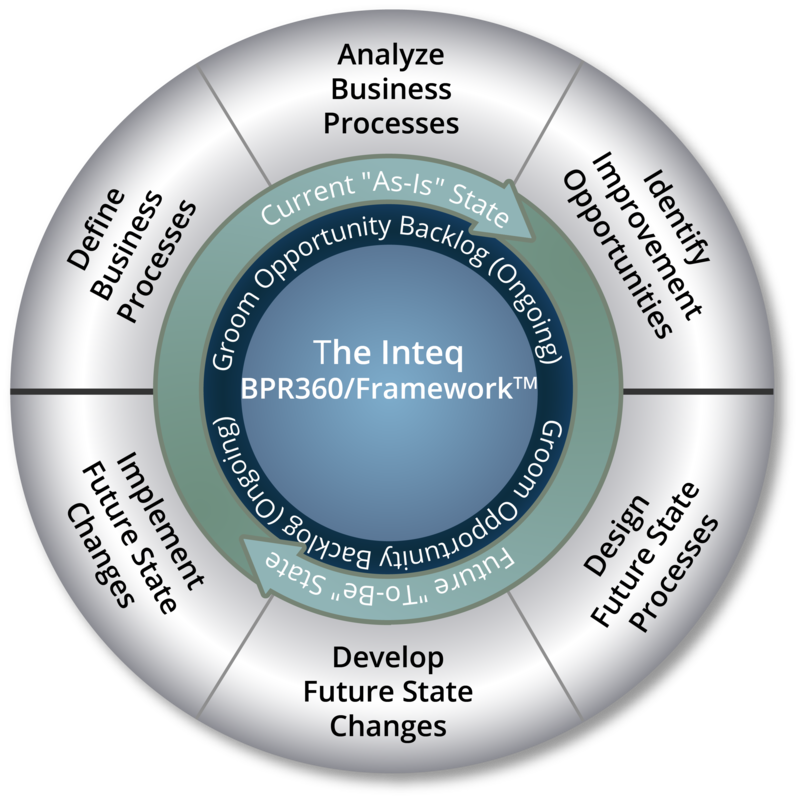 Inteq’s BPR360/Framework™ provides the conceptual blueprint for business transformation – engaging people, processes and technology across the enterprise. Because organizations are complex and chaotic, transformational BPR requires engaging the organization from 360°. This means analyzing how people, processes, and technology engage each other across the tactical, operational and strategic layers of the organization. 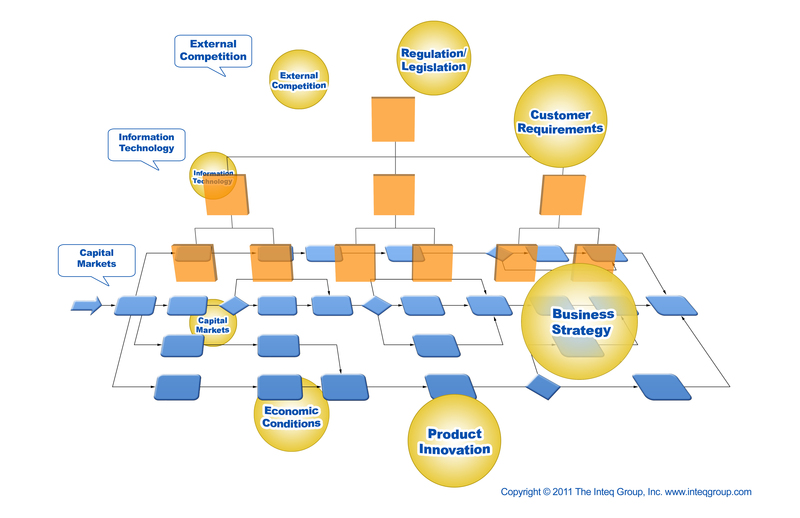 Business process maps and supporting diagrams are core tools for defining and analyzing the tactical layer of an organization. 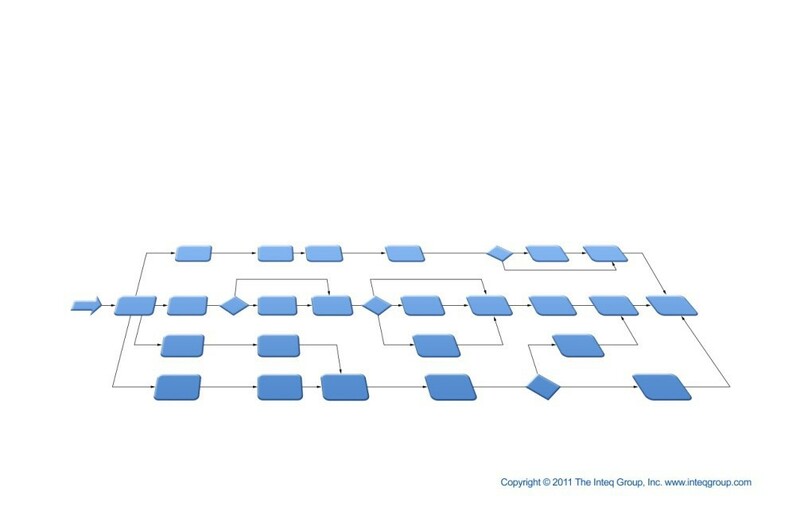 For the purpose of this discussion, the tactical layer of an organization is represented by the high-level illustration of a process map to the right. The blue rectangles represent work activities and the arrows represent the flow / sequence of work activities. Business processes span the enterprise at the tactical layer. The business processes at the tactical layer drive value creation in an organization via the production of the organization’s outputs – products in the form of goods and services for customers. The tactical layer of an organization and its associated business processes comprise a complicated system. There are many interrelated work activities, policies, procedures and technologies comprising and supporting the work activities and the staff performing them. Complexity manifests when the moving parts of a system interact with each other dynamically – involving competitive, conflicting and subjective interactions among the parts. The interactions among the moving parts are based on reasons other than rules based mechanical movement. Business processes at the tactical layer of an organization are complicated – like the gearing of a mechanical watch. This tactical layer of an organization is where mechanical rules are applied: policies, procedures, workflow and supporting technology. Complexity, however, also enters the tactical layer via the interactions among staff performing the work activities. There is significant opportunity for transformation at the tactical layer of an organization. Well engineered business processes at the tactical layer maximize the effectiveness and efficiency of the complicated mechanical components of the work activities and the complex interactions among the staff. Organizations are typically organized vertically / hierarchically from a managerial perspective. 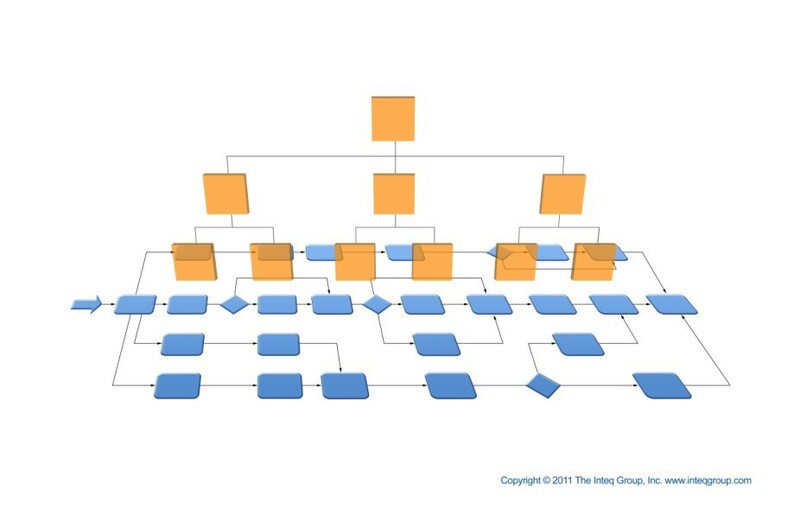 The orange squares in the illustration to the right represent the concept of the vertical organizational hierarchy of an organization. Each orange square represents a supervisory / managerial tier and role in an organizational chart. The tactical (blue rectangles) layer of an organization is complicated – many moving parts. The operational (orange squares) layer of an organization – supervision and management – is complex. Vertically up and down the tiers. Accordingly, as the business processes flow horizontally across the organization, the various work activities are managed by disparate silos of vertical hierarchies that do not always work together in harmony. The operational layer is complicated and complex. While the business processes at the tactical layer (the blue layer) look flat, many tactical work activities (the blue rectangles) are performed up, down and across the vertical tiers at the operational level and even at the strategic level. Two key indicators of opportunities for transformational change at the operational layer are the type and intensity of the tactical work activities performed at the operational layer by the operators (supervisors and managers), and the level of maturity and complexity of interactions among the operators at the operational layer. The transformational opportunity manifests in the splitting of the atom of work activities. This concept refers to splitting the work activities performed at the operational level into two types of components – mechanical rules-based components and knowledge and judgment based components. If various tasks and decisions associated with work activities at the operational layer can be distilled to mechanical rules-based procedures, then that portion of the work activity can be performed at the tactical level. If the work cannot be distilled to mechanical rules-based procedures, but can be distilled into best practice guidance, then the work can be performed at a lower level tier of the operational layer hierarchy. After splitting the work activities and moving the rules-based components into the tactical layer, the remaining tasks and decisions associated with work activities at the operational layer are knowledge and judgment based. These are tasks and decisions that requite experience, expertise and critical thinking. The splitting of rules-based work from knowledge and judgment based work at the operational layer enables the operators to focus more time on operational layer value added work such as coaching and mentoring, dealing with exceptions and non-standard issues, subjective decision making and identifying improvements at the tactical layer. The strategic layer of an organization creates business chaos – and drives chaos down and across the organization into the operational and tactical layers. Business chaos is the apparent and perceived state of flux in an organization as it evolves and changes. Major shifts or changes in an organization’s business environment require an organization to rapidly adapt – or risk going into decline. The emergence of innovative competitors, significant regulatory changes, changes in economic conditions and shifts in information technology are examples of major shifts and changes in an organization’s business environment. The strategic layer is the domain of senior and executive management. It has two core components – external engagement and internal engagement. The focus of the external engagement component is to continually engage the external business environment to proactively scan and identify major shifts and changes – and analyze the associated opportunities and threats. Major shifts and changes in an organization’s business environment are the source of chaos creation at the strategic level. The focus of the internal engagement component is to continually adapt and revise business strategy to counter the threats and leverage the opportunities associated with the shifts and changes. Adapting and revising business strategy is the mechanism for chaos creation. The internal engagement component also focuses on communicating the changes and shifts in the business environment and the corresponding changes in business strategy to the operational layer, and to provide guidance to the operational layer in formulating tactics to execute the changes in strategy. Communication of changes in business strategy and the resulting tactics are the drivers of business chaos throughout an organization. There is significant opportunity for transformational change at the strategic level. The opportunity for transformational change manifests in creating the culture and the mechanisms for proactive, aggressive, highly tuned-in and engaged scanning of the external business environment for shifts and changes; embracing and rapidly responding to the shifts and changes; and clearly communicating changes in strategy and providing tactical guidance to the operational and tactical layers. Every organization continually experiences major changes and shifts in their business environment. The key is a business platform that is high-performing, scalable, extensible, adaptable, robust and transparent, enabling your organization to successfully manage and leverage the chaos of continual shifts and changes in your business environment. The current-state of many business platforms, however, are complicated, complex and chaotic. Transformation can be equally complicated, complex and chaotic. Successful transformation requires substantial business knowledge, adept judgment and seasoned experience. When you are ready for transformational BPR the next step is very simple – contact us and let’s discuss your organization in more detail. We can assist your organization in creating the future-state blueprint of your business platform and in transforming the blueprint into reality. Sign up for our BPR training course to radically change the way you and your team think about your business processes. Contact The Inteq Group today to learn more about how we can enable transformational and sustainable change in your organization.